This lovely MOM Pendant is crafted in 14K White Gold. An accent diamond sparkles underneath to give this simple piece a very charming touch. An 18 inch white gold is included. The pendant measures 12mm (1/2") x 18mm (11/16"). 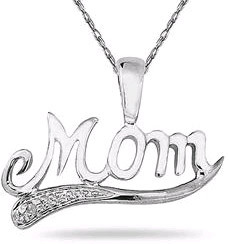 We guarantee our Diamond Mom Necklace in 14K White Gold to be high quality, authentic jewelry, as described above.